Donations are individual monetary gifts made to your school. Donors are the people or organizations that make those gifts. A donor may have directly made the gift himself or could be linked to a donation via a soft credit. You can find donations and donors each in their own report; these reports link you directly to donation pages and donor profiles. The Donations report lists all the individual donations you've recorded—whether manually or received through one of your online donation pages. Use the filter to focus the report on particular kinds of donations. If a donor name is hyperlinked, the donation is connected to a person in your system. If the name is in black text with next to it, the donation has not been linked to a person. If the donation has next to the amount, it is a gift-in-kind donation. Email donors: Lets you email the donors represented on your report. SMS donors: Lets you send an SMS message to the donors represented on the report with a verified SMS number. You'll have the option to send the SMS as an email for those without an SMS number. 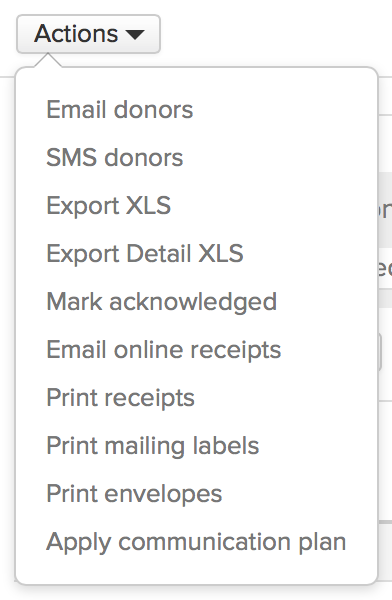 Export XLS:When you export the report, the spreadsheet includes additional columns indicating whether the donation was Made Online and through which Donate Page it was made. Mark acknowledged: Read about acknowledging donations here. Print receipts, mailing labels, envelopes: Receipts export as a PDF; for mailing lables and envelopes, pick a Layout and Format, then click Print to send them to your Print Queue. If your report returns more than 1000 results, these operations will be disabled. The Donors report lists all the donors in your system. A donor is anyone who has a donor status; a donor can be a person or an organization, and may have directly donated or is connected to a donation via a soft credit. Use the filter to focus the report on particular kinds of donors. Email donors: Lets you email the donors shown on your report. SMS donors: Lets you send an SMS message to the donors on the report with a verified SMS number. You'll have the option to send the SMS as an email for those without an SMS number. Tag/Untag donors: Create and add a new tag to all the donors returned by your filter conditions, or search existing tags and remove them from anyone in your filtered group with that tag. Print yearly summaries: Summaries export as a PDF. 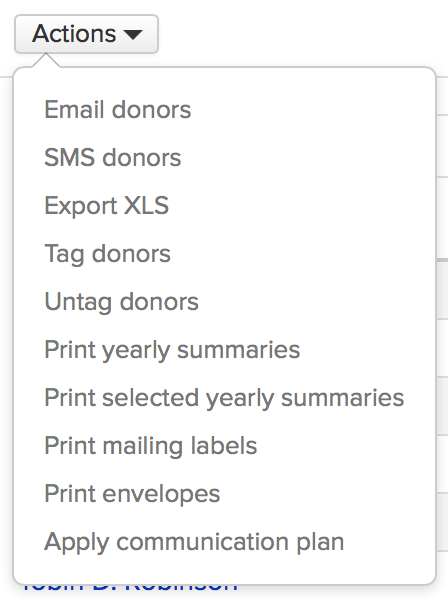 You can print summaries for all donors in the chosen tax year, or for those shown by your filters who have donations posted in the chosen year. If your report returns more than 1000 results, these operations will be disabled. Print mailing labels/envelopes: For either mailing lables and envelopes, pick a Layout and Format, then click Print to send them to your Print Queue. If your report returns more than 1000 results, these operations will be disabled. The Recurring report shows all recurring donations. The report sorts recurring donations by the most recent start date. Use the filter to focus the report on particular kinds of recurring donations. Show history: This shows a list of all donations made in this series, including links to the individual donation pages. Change donation info/amount: Update any of the donation info details (credit card number, address, etc.) and the donation amount. You must fill in the entire form in order to save changes to any of this information. 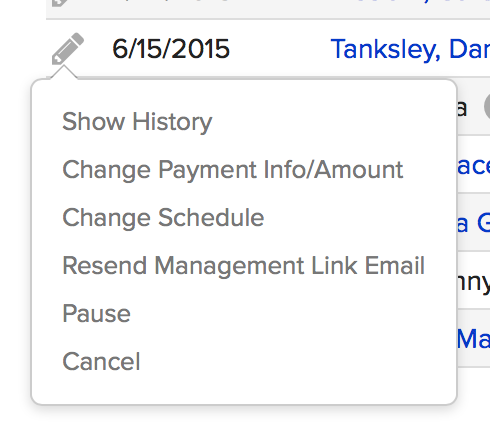 Change schedule: Select a different day of the month on which to run the recurring donation transaction. Pause/resume: This lets you pause the recurring donation, or resume one that you paused earlier. Cancel: Cancelling a recurring donation only affects future donations. Donations are identified by their number. To view the donation's details on its page, click the Donation # wherever you see it—whether on a report or a donor's profile. Details: This section includes the basic financial transaction details; for Online Donations, it also links to the credit card transaction receipt (different from the PDF receipt). Campaign tracking: If this donation is connected to a campaign or appeal, you'll find those details here. If you need to change anything, click edit and select the correct items from the drop-downs. Breakdown by fund: Most donations go towards one fund, but if a donation is split among two or more funds, you'll find all those details here. Donor comment: If the donor left a comment on your online form, that will be displayed here. Acknowledgement: You can mark the donation as acknowledged, view the acknowledgement details, or click to un-mark it as acknowledged. Read more about acknowledging donations below. Print Receipt: This creates a PDF with donation details that the donor can use for tax purposes. There's also a link to the online receipt. Custom info: If you keep track of custom donations fields, here's where you'll record them. Click add, select a field, and enter the info. This information is available when you export any report in donations. Possible match: If Populi matches the name to an existing person/organization in your database, you'll see them listed here. Matches are based on some combination of name and contact information. Click a suggested name to go to that person's profile. If it's a good match, click the radio button and then Apply. Add as a new person: Click the radio button and then Apply to create a new person/organization based on the donation info. Link to an existing person: If there are no matches, but you know this person is already in Populi (say, she's entered under her maiden name but she donated after getting married), click the radio button and then search for existing people/organizations. Once you've found the match, click the name and then Apply. Keep in mind that the name on the donation will be replaced by the name of the person/organization to whom you linked it. The other donation information will be added to the pre-existing profile. If you link a person as the donor, Populi will suggest people listed under the donor's relationships for the soft credit, as well as any organizations of which the donor is a member. For example, you might want to link the donor's wife as a soft credit—provided you've linked her on the donor's profile, Populi can suggest her (it will also suggest brothers, roommates, etc.). Likewise, if you link an organization as the donor, Populi will suggest people listed as organization members for the soft credit. You can add multiple soft credits to any donation. If you make a mistake, click unlink to remove a donor or to remove someone as a soft credit. After receiving a donation, it's common practice to acknowledge the donor. You might have any number of ways you do this: perhaps you send a printed letter or maybe an email. Whatever the case, you'll want to keep track of whether or not you've acknowledged a donation. Donations report: This lets you mark several donations as acknowledged in one go. 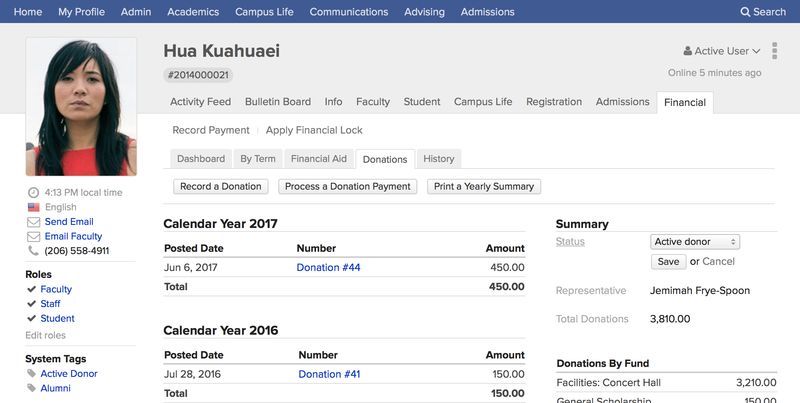 Use the filter to focus the report on the donations you're after, click Actions, and select Mark acknowledged. Individual donations: This lets you mark donations as acknowledged one at a time. Go to a donation's page and look under the Acknowledgement heading. Here, you can mark the donation as acknowledged, view the acknowledgement details, or click to un-mark it as acknowledged. Find the donor person or organization in Search; click the Financial view and then Donations. Click the donor person/organization's name wherever you see it in Donations—including the Donations report, the Donors report, or on an individual Donation page. You can also see donations under Recent Transactions in the donor's financial dashboard view. Potential: these people may be interested in donating. Active: these people have donated (or are the soft credit for a donation) and are still interested in receiving communications from you about further donations. There's also Not a donor, which you should select if someone has been mistakenly marked as a donor. Each status is associated with a corresponding system tag (Active Donor, Inactive Donor, and Potential Donor). You can also assign a representative to a donor. Select a Donations user from the drop-down. Now that you've added a representative, you (and the rep) can use the various report filters to see lists of donors assigned to that rep; this facilitates communications, tagging, etc. If you've enabled recurring donations, then you may view any recurring donations this donor has set up here. Click to manage the donation (see above).